Al and Leo announced that the Oscars have gone completely green. I beg to differ. If the Oscars were really green, shouldn't people be given the option to arrive by public transit? The Hollywood and Highland Red Line (subway) station is closed all day today for the Oscars. Read MTA's announcement. That's not all, the streets near the Kodak theater have been closed down for a whole week. As LAObserved pointed out, "Pasadena keeps the Rose Parade route open to the public pretty much until show time. Ditto for the Los Angeles Marathon. But for some reason, busy Hollywood Boulevard has to be closed for a full week before the Oscars ceremony." They shut down a busy arterial for a whole week, snarling traffic (and increasing air pollution). Bus lines had to be rerouted (through tomorrow!?) to accommodate the event. Pedestrians were sent on a long detour through a warren of dark corridors because the sidewalks were blocked off. Yeah, but the stars don't take the subway, they arrive by limo, right? Not exactly. It takes a great many people to put on a show like that. Mark knows someone who works for the Academy and is up there in the nosebleed section. He doesn't have a limo. He wanted to take the subway to work tonight but was thwarted. It is a long walk between the Hollywood/Vine and Hollywood/Highland stations, especially when you are wearing high heels. Everyone knows that, in Hollywood, the more people you can screw, the more power you wield. Why the MTA and the city of Hollywood went along with it, I don't know. We didn't get it together in time this morning to attend the Family Festival at the Getty Center today. In fact, by the time we got there, we couldn't even get off the 405 because of the line of cars backed up trying to get into the Getty Center parking lot. We decided to go one exit further to the Skirball Center. However, despite years of Hebrew school, Mark forgot that the Skirball is closed on the Sabbath. 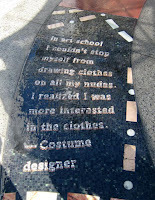 "In art school, I couldn't stop myself from drawing clothes on all my nudes. I realized I was more interested in the clothes." --Costume designer. We decided to keep heading north on the 405 and exit at Ventura Boulevard to find lunch somewhere nearby. While driving along, Mark got the idea that we could go to the Red Line Park and Ride and catch the subway to Hollywood for lunch. Somehow, he promised Iris a burger at Hamburger Hamlet at Hollywood and Highland. That turned out to be another nightmare because we all forgot about the Oscars. It was a madhouse. Hamburger Hamlet was closed. We ended up waiting (and waiting) in line for a burger at Johnny Rocket's because Iris would not be denied a burger after such a long journey. Burgers are such a rare treat for her. Mark said he would post about the Oscars later, after a work deadline. Serendipitously, we ran across the Los Angeles-Italia Film, Fashion and Art Fest. An Italian designer, Milena Canonero, was up for best costume design for the film, Marie Antoinette. Several dresses were on display and the security guard let me photograph them with the flash turned off. 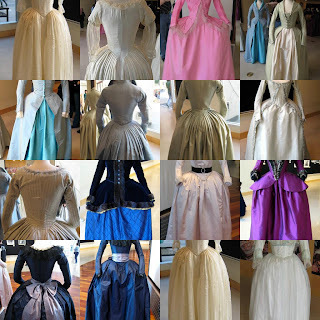 I made a collage of the dress photos. I don't know how we could have forgotten about the Oscars. Mark and his team had even won the Oscar edition of O'Brien's Irish Pub Quiz last Wednesday night. Take a look at their team photo. You wouldn't want to run into them in the dark alleys of Pasadena and Cambridge. They might make you play trivial pursuit against them for the contents of your wallet. I replied that he was not at home; could I take a message? She asked if I was the lady of the house. Then she started reading a spiel very quickly. She spoke so rapidly, I can't quote her exact words. It sounded like a "push poll"; she asked whether I agreed or disagreed with statements. But the statements were worded to try to plant a point of view. She babbled about how Hollywood made movies to make money and had no morals. I can agree with that statement. But she went on and on about how they had to be controlled with laws. I told her not to take her family to the movies. She changed tacks to discuss the state of television. Again, she read a rapidfire script about how television was amoral. I told her to turn off her television. She said that you can't always control what your children watch. I told her that, if it bothered her so much, get rid of her television. Mark says that every TV set sold in the last few years contains a V-chip. Program it and your problem is solved. I would do that, if I weren't so sick of technology by the time I got home from work. Sigh. I will just continue to be a bad mom and let Iris watch whatever crap programming she finds on the 100 channels of not much that passes for our cable package. It doesn't matter as long as there is meat in your bag. Researchers at the University of Chicago compared the global warming impact of meat eaters with that of vegetarians and found that the average American diet – including all food processing steps – results in the annual production of an extra 1.5 tons of CO2-equivalent (in the form of all greenhouse gases) compared to a no-meat diet. Researchers Gidon Eshel and Pamela Martin concluded that dietary changes could make more difference than trading in a standard sedan for a more efficient hybrid car, which reduces annual CO2 emissions by roughly one ton a year. "It doesn't have to be all the way to the extreme end of vegan," says Dr. Eshel, whose family raised beef cattle in Israel. "If you simply cut down from two burgers a week to one, you've already made a substantial difference." You don't have to become a complete vegan. Simply consume fewer animal products and you will dramatically reduce your carbon footprint. Read Humans' beef with livestock: a warmer planet in the Feb 20 edition of the Christian Science Monitor. I will repeat myself. You don't need to hang out all of your laundry on a clothesline. If you just hang out the stuff that takes forever to dry; like towels, jeans, sweaters and t-shirts; you have cut down dramatically the amount of energy you consume for laundry. 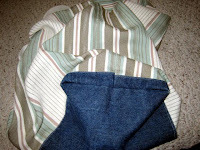 If you would like to avoid the whole paper or plastic debate at the grocery store, read on for directions on how to make your own reusable cloth bags to take with you to the grocery store. I was going to write a full-blown tutorial, but that is not necessary because Nancy Restuccia, author of Hold It! 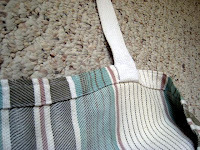 : How to Sew Bags, Totes, Duffels, Pouches, and More, has beat me to it here. I learned how to make my own bags by reverse engineering totes that I already owned, browsing the LL Bean website for functional tote sizes, and reading her book. It is a wonderful book that has gone out of print; I recommend snagging a used copy of it before they become extremely scarce. I don't use straps all the way down the sides as Nancy recommends. I attach the straps to the top while I hem it. Then I turn the handles up and sew it down again in a box with a X across it. I do reinforce the bottom. I bought the canvas and denim from SAS Fabrics in Lawndale. SAS sells leftovers from factories (cheaply) by the pound. I bought a roll of the cotton webbing from Random, a fantastic store on State Street in Santa Barbara. They sell closeouts from businesses and salvage from places about to be torn down or remodeled. Once, we visited when they had piles of art deco tiles and glass blocks from a hotel about to be demolished. It was bittersweet. Looks like I need to hike the Appalachian trail. The map projection also looks very strange. I need to get out more. This map would look more impressive if I added airports where I transferred planes. But that would be cheating. Mark has traveled in Africa and I have traveled in Asia. Jointly, we have been on every continent except for Antarctica. (Once, I attended a meeting where we realized that I was the only one in the room who had NOT been to Antarctica yet.) Mark and I made it as far south as Punte Arenas before running out of time and money. He wrote about our trip here. Email me for tips on booking travel for Patagonia. I found this picture in the NY Times coverage of the Fall 2007 Calvin Klein runway show. I have found a connection between traffic congestion (and climate change) and fashion. How far can you walk with those shoes? How did wasteful behavior become the fashionable standard and the practical become outre? 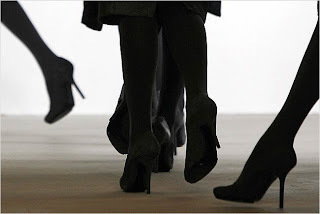 How many shoes made for walking does the great Manolo praise? "Manolo loves the shoes", unless they are made for walking. Those are objects of ridicule. Back to Calvin Klein. I do love the clean lines of this combo. The pockets are a nice, subtle detail. Even though the model is incredibly thin and I have the dimensions of a mere mortal, I think it would look good on me. The Calvin Klein silhouette is traditionally quite slim. I have a collection of CK skirt patterns from the 1990s. I shortened them to just above the knee and made four styles in various light and medium weight Italian wool remnants I bought at Denver Fabrics. I still receive compliments every time I wear them. I do love, love this dress from the Anne Klein Fall 2007 collection. The neckline detail is so awesome. 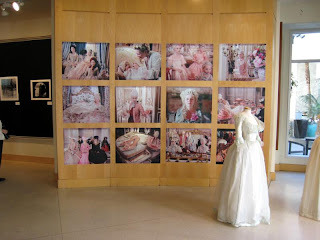 I have been a big Isabel Toledo fan since the 1980s, when she partnered with Vogue Patterns. Her pockets are to die for. Much ink has been spilled about the skinniness of the current crop of models. I thought it was no big deal; models have always been skinny relative to the general population. But, I didn't realize just how skinny they had become. My eyes had become slowly adjusted to a very unhealthy image. The industry has proposed a minimum BMI of 18 or 19 for models. Does that mean there are working models below that threshold? I recall reading about the heights and weights of the glamazons of the 1990s. They were about a BMI of 20. Tyra Banks said in this AP article that she is 5'10" and was 140 pounds when she posed on the cover of Sports Illustrated 10 years ago. She reprised the bikini photo at 161 pounds today. If you look at a BMI chart, she had a healthy BMI of 20 then; today, her BMI is a healthy 23 despite all the articles about her so-called plumpness. Tonight, our whole family helped to hang quilts in preparation for this weekend's quilt show. Iris was not very helpful. Every year, at this time, I am thankful that I had the foresight to marry a tall man. The guest lecturer's art quilts are amazing. Cindy Rinne will give a lecture Sunday at 11am. at the Torrance Cultural Arts Center. My Flying Kimonos quilt is hanging in the Toyota Meeting Hall, near the South wall. All the quilts look great. 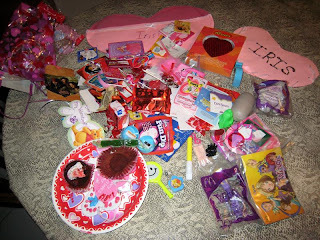 This is Iris' loot from first grade, after school daycare, and Brownies. 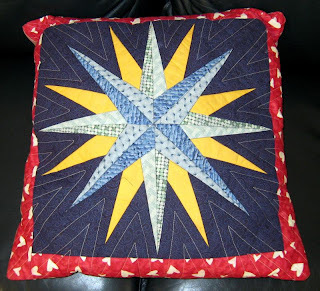 I made this paper-pieced pillow for Mark for another Valentine's day, perhaps a decade ago. I was so excited about finishing the project, that I sandwiched and quilted it before remembering that I forgot to remove the paper! You can hear it crinkle when you lean back on the pillow. 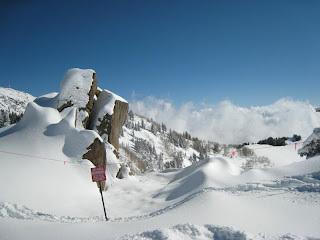 It snowed 20" at Brighton after my last post. We went back to the aforementioned black diamond run (Aspen Glo) and skied it over and over until our legs turned to rubber. Skiing doesn't get any better than that. 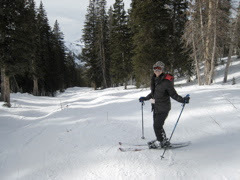 Grandma Ann of Sitting Knitting and I were skiing at Brighton, Utah on Saturday when we wandered onto a black diamond run by accident. We have the pictures to prove it. That's her, above, with the aspen trees behind her. 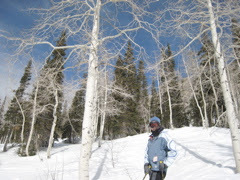 I am standing in front of the moguls on the narrow trail below. Of course, I felt badly about the climate-altering effects of our trip. Coincidentally, the NY Times ran a story on February 11 about Making High-Flying Guests Fuel-Efficient. Burning a gallon of gasoline or of jet fuel produces approximately equal amounts of carbon dioxide. The airlines say that that each gallon moves a passenger about 20 miles, so a 1,000-mile trip would use about 50 gallons. Several years ago, I read that it was 30 miles passenger miles per gallon. I don't know the methodology used to derive either number, but at least they are in the same ballpark. 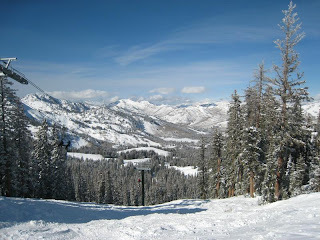 I feel grateful that I can even ski this year. I would like to thank my physical therapist, rheumatologist, orthopedicist, immunologist, internist... You get the idea. I get so much knitting done because I spend an awful lot of time in waiting rooms. On this trip, I discovered the link between climate change and declining birthrates. Remember! You read this here first. In my twenties, I didn't allow myself to think about children. I was supposed to focus on research and finishing my dissertation. However, there were times when the longing for children was palpable. One such instance occurred while I watched a mother ski with her toddler between her legs. When would I do that with my baby? Back to the trip. Today, I learned Mark can ski backwards. Iris was having difficulty with the near white-out conditions at Alta this morning. 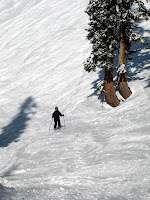 Mark coaxed her down the run by skiing backwards in front of her. After that one run, I checked her into daycare at her insistence. Yesterday, at Brighton, she tore up the slopes. I skied the last run with Iris and her class (one other girl and an instructor). He shouted out, "Look, trees! Should we go through them?" The girls cried out, "Yes!" and dove in after him. The bumps in the trees scared me but my little girl was hopping from one mogul to the next. After a bit, he asked if they should go back into the trees or go out to the run. The girls shouted, "Trees! ", and went back in. I wisely stayed on the groomed run next to the trees. Iris jumped off one mogul and kicked out both feet like in the ski movies. She said that she was so good at that because she practices her jumps in tae kwon do. * Correlation does not imply causality. However, people who study birthrates for a living report that living in a society where childrearing is common makes young people more inclined to have children. That is, we pattern our behavior after social norms that we observe around us. I wrote a bit more seriously about climate change and jet travel in Procrastination and Climate Change. The National Drought Mitigation Center has declared a moderate to severe drought over much of southern California. Click here to see the U.S. Drought Monitor map for the southwest. Much ado has been made about how dry this El Nino winter has been. But, El Nino only loads the dice for a wetter than average year. Warm offshore water doesn't bring rain if the jet stream (a fast-moving current of air several miles above the earth's surface) doesn't cooperate. The jet stream brings unsettled, stormy weather below it. (Think Bernoulli's principle; fast-moving air has lower pressure.) Often, in February, the jet stream splits into two with the southern branch residing over southern California. Some years, the jet stream splits a little bit earlier or later (or never). Anyway, that's why February is historically the wettest month in LA. The California Regional Weather Server has an excellent jet stream page. I like to look at the eastern Pacific and western north America plots. Notice how, lately, the jet stream tends to just miss us, either to the north or to the south? Compare this with the record setting rainy winter of 2005. Is it really an El Nino? Take a look at the National Weather Service's tropical Pacific sea surface temperature (SST) and anomaly animation. (The anomaly is the difference between the actual conditions and the climatological average.) Last fall, it looked like we were headed into an El Nino situation with the SSTs in the eastern Pacific warmer than average. But it doesn't look like that is true any longer. By January, the El Nino near the equator had all but disappeared. If anything, the SSTs off the southern California coast had become colder than average. I like the SST analysis and anomaly plots from the Navy's Fleet Numerical Meteorology and Oceanography Center better. Unfortunately, they are in the midst of a computer system upgrade and have no recent data available. However, take a look at the SSTs during Hurricane Katrina. Type "30 C to F" into Google if you think in Fahrenheit instead of Celsius. Can you spot the Gulf Stream? One of my coworkers has plotted LA rainfall statistics in a meaningful way. Go take a look. Read more about Los Angeles Rainfall statistics (skewness!) in an earlier post. That's all folks. When we looked at the loot, we both thought about the goodie bag at a toddler birthday party a few years back. 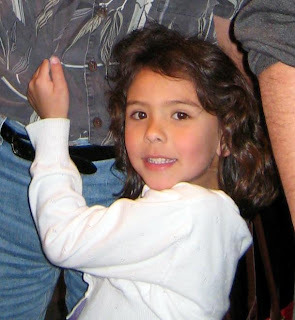 Both of the little girl's parents work in Hollywood, but they also work hard to 'keep it real' for the sake of their daughter. Imagine my shock and horror when the mother handed me a huge shopping bag for a goodie bag. I peaked inside and saw several games, toys, two t-shirts, and two largish stuffed animals--all in the same cartoon character theme as the party. All I could think was, "She upped the ante! I can't believe she did that. There is no way I am going to be able to keep up with this." I must have looked really panicked. The mother quickly related how she had called the promotions department at Movie Studio X and asked if they had anything they wanted to get rid of. Before she was off the phone, some gofers had dumped six boxes of this movie promotional stuff in her office. Then she asked if Iris liked the cartoon character. There were still two more boxes of this stuff in her garage she needed to unload. I need to stop obsessing about goodie bags. This is my sixth post on the subject. Iris' nanny gave her a fantastic haircut. Look at the softly layered shoulder-length bob that beatifully show off her natural soft waves. Is it not adorable? Should I beg for a matching cut? Look at the schematic below. The pentagons are numbered in the order I plan to knit them. Number six will join five and one to complete the circle. The black and blue lines look very similar in the thumbnail below; click on the image to see the true colors. On one needle (black lines), I cast on 12*28 stitches using a long-tail cast-on (LT CO). On another needle (blue lines), I LT CO 6*28 stitches. On double pointed needles (red lines), I used a provisional crochet cast-on for 28 stitches 6 times. I learned the technique from Lucy Neatby's Spun Yarn Newsletter #13. I've been very busy lately so the only picture I took of the process is spread out over two chairs in my immunologist's waiting room. I am starting pentagon #5. I will pick out the crochet chain on pentagon #4, place those stitches on a needle, and knit (or purl) those 28 stitches, knit 2*28 stitches off the bamboo needle (black lines in schematic), knit 28 provisional crochet stitches off the double-pointed needle (red lines), and then 28 stitches off the green needle (blue line). Remember when I obsessed over needle sizes to get the desired pentagon size? 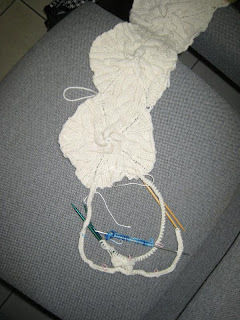 I needed to begin on row 5 of the Capecho chart so that the cables flowed smoothly between pentagons. If I started on another row, I would have had to adjust the cabling maneuver rows. That's not too difficult if you are knitting your pentagons in the round as I am. I am not entirely happy with this technique. The LT CO stitches stretch between pentagons and the trailing multiple needles are a pain. Earlier, I tried using a long-tail cast-on for 2 sides, then knitting a crochet cast-on by alternating between the two yarn ends, then LT casting on for another side, dropping the short tail and then knitting up the last crochet cast on. If this sounds confusing, that is because it is. Anyway, that attempt was fine until I got to the neighboring pentagon and tried to pick up the provisional stitches. All those extra loops from the two yarn tails were a nightmare. I gave up and decided to cast-on all outer edge stitches at once. There were several other frustrations. When picking up the provisional loops in ribbing, the crochet chain does not come out cleanly. Furthermore, there is a half-stitch jog at the joins if you look closely. You can knit a regular pentagon in any stitch pattern as long as you know your row and stitch gauge. Take a look at Wolfram Mathworld's pentagon page. Do you see the regular pentagon with labels R (circumradius), r (inradius), and a/2 (side)? Decide your side length and multiply that by your stitch gauge for the number of stitches to cast-on per side; let's call that number n. (Read Sizing Knitted Pentagons for help.) 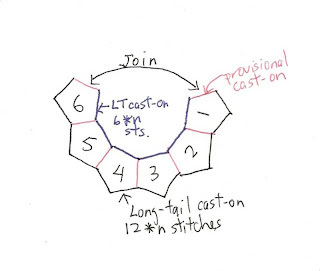 You want to cast on 5*n stitches and reduce stitches until you end up with 5 or 10 stitches at the center of the pentagon. Calculate the length of your inradius, or the little r in the Wolfram pentagon schematic. Type sqrt(25+10*sqrt(5))/10 into your Google search bar and you see that r = 0.688*a. Multiply r by your row gauge to find out how many rows (call this RC, your row count) you need to knit till you reach the center of your pentagon. If you start with n stitches and need to decrease to 2 stitches, then you need to decrease once every (n-2)/RC rows. Suppose you want to knit a stockinette pentagon with 3 inch sides with a 5x7 gauge. You need to cast on 15 stitches and decrease over 14.5 rows. Let's round it to 14 rows. That means you decrease at the beginning (or end) of each side on every row for 14 rows. Then cut off your yarn with a longish tail, thread it through a needle and draw it through your remaining loops twice to tighten up your hole. Weave in the end. That's all there is to it. Don't be afraid of the math. Just cast-on and play. It's only knitting and yarn is very forgiving. When I was almost ready to write my thesis, my adviser told me that I needed to read two more books. He explained that the wisdom contained in The Elements of Style by Strunk and White and The Visual Display of Quantitative Information by Edward Tufte would save me many a rewrite. The former didn't leave much of an impression on me but the latter transformed the way I looked at data display. I have been a fan of ET, as he calls himself, ever since. I had the opportunity to a class from him in downtown LA on Wednesday. The ballroom was packed with people from as far away as Miami. I had expected to sit in a room with a bunch of rocket scientists. Instead, I was amazed at the broad mix of people and disciplines. The need to clearly show quantitative information and to explain its meaning is universal. Every class participant received a boxed set of his four hardcover books. Our corporate library has multiple copies of the first three books; I have read and learned from them. I am looking forward to reading the most recent book, Beautiful Evidence. I have heard so much of his tract against PowerPoint. Now, I can read it firsthand in the book. I had never heard of the term, sparklines, before Wednesday. I had been employing them (badly) for the last couple of years. I can already see how to improve some of the figures in my reports. ET's central point that he drove home repeatedly was that good design should be transparent. You want the audience to concentrate on your content, not your design. He further added that we should copy the professionals. Sports statistics, the weather section and financial market tables have undergone much human factors testing; copy those well-tested designs. I read the latter two sections in my capacity as a meteorologist and chief household portfolio manager. The sports pages usually go right into the recycling bin with the advertising circulars. From now on, I will peruse the sports pages to study how to better report statistics. I already learned something useful from perusing the sports pages this morning. I didn't know that the outdoors column of the LA Times was buried at the back of the sports section. The gray whale migration, which is slowly getting later because of climatic changes, is beginning to peak off Southern California. The Point Vicente volunteers this week have been posting daily counts in the 20s and 30s. Read the whole column about climate change and how it affects marine life here. We last visited Point Vicente in Tie-Dye Family. Sunday, we hope to ride our family bike out to Point Vicente for a picnic and whale watching. If Palos Verdes Peninsula is too far away, you might consider watching from a pier. People have reported good whale viewing from the Manhattan Beach Pier. Additionally, the Roundhouse aquarium at the end of the pier is always fun for kids. Science and art have in common intense seeing, the wide-eyed observing that generates empirical information. --Edward Tufte in the introduction to Beautiful Evidence. Norah Gaughan was questioned about the incongruity between her current work as a designer and her academic training as a scientist by the interviewer for Vogue Knitting magazine. Norah very graciously replied that it was not such an odd juxtaposition. Good for her. I knew there was reason why I am attracted to her work. We spent our date night this week in an incredibly dorky way. Mark doesn't want to reveal what we did lest that inspire any of his competition. Instead, I will show pictures of last week's date night at Gina Lee's Bistro in Hollywood Riviera. 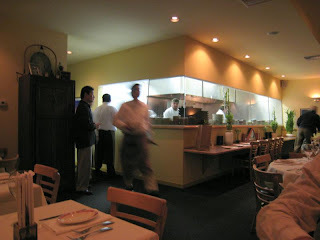 That's the owner, manager, and Gina's husband, Scott Lee, standing in profile by the kitchen. I like to hear the waiters recite the daily specials from memory. It's a really delightful performance. 9 times out of 10, I will order the bento box daily special. Of course I scarfed down the first crab cake before I thought about bringing out the camera. (I turned off the flash out of respect for the other diners so the picture is a bit blurry.) Clockwise from the top left: dipping sauce for the crab cakes, crab cakes, grilled salmon on greens, Korean BBQ beef, coleslaw in a lettuce cup, coconut lemongrass soup with mint leaves and a fried whitefish cutlet. 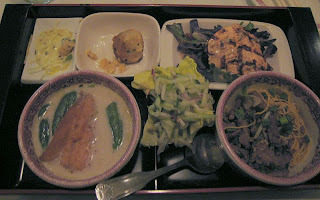 It sounds like I am in a rut, ordering the bento box so frequently. However, the contents change depending upon what Gina Lee finds at the market that day. It rarely disappoints. If you visit the restaurant with a large group, order the catfish. You have to see this dish. It is a beautiful piece of performance art that tastes pretty good. The entire catfish is fried and arranged like a giant S on the plate. The catfish cradles a pile of Asian-influenced coleslaw. Ponzu dipping sauce provides the perfect accompaniment. The only flaw of that dish is that it is too much of a good thing. That's why you should go with a large party and eat family style. The menu does not provide many vegetarian options. Tell Scott that you are a vegetarian and they will fix something seasonally delicious for you. Unlike the reviewer below, I like the desserts there. We shared the Hawaiian bread pudding with mangoes and macadamia nuts. When Iris comes with us, she always saves room for the chocolate pistachio bars. Link: Irene Virbila's review of Gina Lee's Bistro.